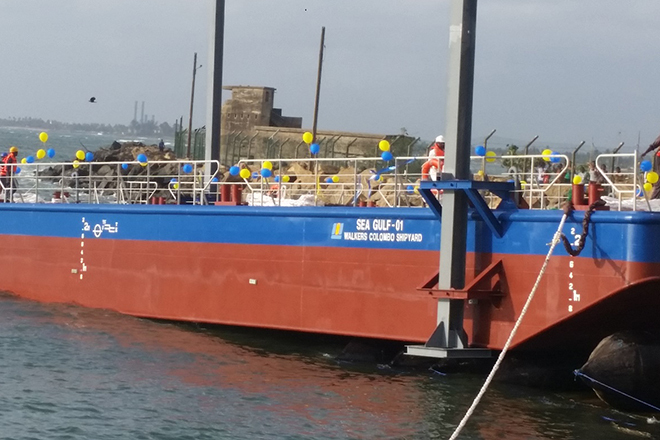 Sept 01, 2016 (LBO) – Walkers Colombo Shipyard (Pvt) Ltd, a subsidiary of MTD Walkers PLC, has successfully completed the construction of its first vessel, a barge named ‘Seagulf 1’, to re-enter the local ship building industry. The barge designed and constructed entirely by in-house engineering teams under the guidance of Sarath Obeysekera, Managing Director of Walkers Colombo Shipyard (Pvt) Ltd., was launched recently at the Walkers Colombo Shipyard in Mutwal Harbour. “We are extremely pleased with the rapid progress made by the Marine Engineering sector of the Group and hope to see growing contribution to Revenue and Profits from this sector,” said Viraj De Silva, Chief Financial Officer of MTD Walkers PLC and Director of Walkers Colombo Shipyard (Pvt) Ltd. He was commenting on the group’s strategy to establish shipyards across the island to cater to the growing demand for quality ship repair and shipbuilding services in the Indian Ocean. MTD Walkers PLC, Sri Lanka’s only fully integrated engineering solutions provider, expanded its presence in the Marine Engineering sector in 2015 by unveiling its plans to open a state of the art ship repair facility in MutwalHarbour with an investment of USD 8.5 million. Funding for the development of the yard was procured through the proceeds of a LKR 3.0 billion debenture issue in September 2015. “The commencement of operations at the Group’s first Shipyard will provide us a natural hedge and allow us to raise future capital at very competitive rates in the international market,” said Mahesh Yogarajan, Executive Director, of Walkers Colombo Shipyard (Pvt) Ltd. The 3.5 acre facility upon completion will be equipped with a Shiplift and Transfer System, a first in the Sri Lankan Marine Engineering sector, capable of accommodating a broad range of vessels up to 1,250 Tonnes. Walkers CML also envisages to provide much needed repair services to Sri Lanka Fishing Boat Industry by installing Boat Lifts in many fishery harbours to cater for lifting of boats up to 60 tons. The shipyard has already commenced the construction of two tug boats which will be used to assist operations at the shipyard when it commences commercial operations in January 2017.